Powerlifting is a sport that combines technique and over all body strength and is as tough as the name implies. You would think that being diagnosed with a disorder of the central nervous system would end a powerlifter’s career, but for lifter Nelson Sleno, it has become more of a rallying cry and the resolve to not let the disease take control of his life. Sleno was diagnosed with Parkinson’s Disease 15 years ago. “For the last three years I have managed to overcome, with the help of my medications, the hold that Parkinson’s Disease had me bound by for the previous 12 years. I still have the disease and I get more symptoms to deal with as time passes but I deal with them,” Sleno said of his battle with the disease. Previously a competitive powerlifter, he had given up the sport prior to being diagnosed. But since taking control of his illness over the past three years he has written a book titled ‘Shaking Hands,’ as well as a sequel, and got back into competitive powerlifting – his first competition in 20 years. He established two Ontario records in the 60+ years and under 59 Kilo class with a 120 kilo (264 lbs) squat and a total lift count of 305 kilos (671 lbs). Powerlifters compete in three lifts – the bench press, squat, and dead lift. The combined weight of successful lifts goes toward the final score. Sleno has now turned his return to powerlifting into more than just setting a record. At an upcoming competition in Oakville, he will attempt to set a Provincial record in his class while raising money for the Southwest Ontario Parkinson’s Association. 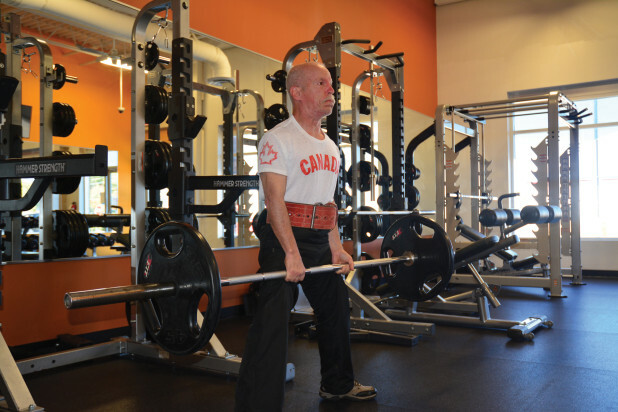 “I’m challenging the public to become part of my lifting team to help lift the burden from the shoulders over 100,000 Canadians (who have Parkinson’s),” he said. He hopes to raise $10,000 in pledges for his attempt at the record. There are two divisions in powerlifting – equipped and classic. In the classic style in which Sleno will be competing, other equipment such as knee wraps are not allowed. Only a belt is used for support. Sleno really believes in his reasons for raising funds for research. Sleno will compete in the Titans of Mississauga Powerlifting Competition in Oakville on October 15. You can find out more by visiting the Parkinson’s website at: www.parkinsonsociety.ca.